Hi everyone, and welcome to the other side of Memorial Day, the unofficial start of summer! I hope you had a great holiday weekend. The hubs and I spent ours doing a yard drainage project, which required us to hand dig a 65 foot trench, install drainage pipe, and haul (literally) 500 pounds of gravel. I'd show you a picture, but it would literally be a picture of mud. It was a nightmare from start to finish, but it actually works. It really does carry the water away! I have a few more to make to catch up. I also started on the sashing, mostly so I can keep track of my blocks. Aren't those brights cheerful? I think the white sashing works with all those colors. I have indoor pictures today because it's pouring out again. The little dog there is one of out "pets." I'm allergic, so this is as close to a real dog that I can have. I also finished all of the blocks for the Scrap Happy Rails quilt, though I haven't put them all together yet. That's a good goal for the end of this week, don't you think? I also packed up the Hands to Help donation quilts and sent them off to their new homes, and I did a few drawings for a quilt using those letters. All in all, I think that's a lot, what with all the digging and everything! This week promises a ton of rain, so maybe I'll be able to do a bunch of stitching. We also have a carpenter coming to start building a pantry, and the electrician is coming back. By September we'll be a lot less like a construction site, I hope. But I'm definitely finished with the digging! Spring Cleaning-- The Big Finale and Giveaway! Hi everyone, and welcome to the last of the Spring Cleaning series! I'm glad you're here to wrap this up! Well, it has been a long haul, what with all the cleaning and tossing and organizing. But I hope it's paid off for you in the same way it's paid off for me. Today I want to talk about my organizing/ cleanout experience, show you some pictures of my sewing room, and say some final organizing things. Plus at the end of this post is a celebratory giveaway! Last month was the third anniversary of this blog, which I completely missed, so this is a sort of double celebration. I should say right up front that my sewing room never looks like this. NEVER. It usually looks like a dozen preschoolers have abandoned an art project in the middle of the floor--and the tables, and the rug and everywhere else. I cleaned up just for you! I am lucky enough to have a 12 by 12 foot bedroom as a sewing room, and it's basically square, which made it pretty easy to set things up the way I wanted them. This is the major sewing area, where I keep both machines set up and ready to use all the time. I call this "the nest," and I love how it works for me. I have a small ironing table tucked under the longer table, and I use this while I'm sewing, which is really super-handy. Although I seriously lust after one of those Koala cabinets and/or a Martelli table, I got these two tables at Ikea and they were really, really inexpensive. Before we moved I had an old dining table and that worked well, too. The best thing about these tables is that I can move them around pretty easily, so if I need more work area I can just swing one of them around. I used to sew on a used dining room table, so I'm thrilled to have these, actually. The shelves behind the tables hold everything I need right at hand, including a little warmer for my tea, because sometimes I forget it's there and then it's cold. Hey, sewing takes concentration! This is where most of the notions live, and it also houses the one essential for every sewing area, the junk basket. Nobody's perfect! This is a Kallax shelving unit from Ikea in the biggest size, and it houses just about everything. This was really one of the best purchases ever. This is all my fabric except for the scraps. The yardage is on comic book boards, and then the top cubbies hold precuts, half yards, and panels and other specialty pieces. The books are on lower shelves, and then the bins at the bottom hold scraps of specialty fabrics (like flannel), bags of cut scraps, and other essentials with no other home, like some Insulbrite fabric, some felt, and a few pieces of wool. The baskets on top of the storage unit are functional as well as pretty. These hold all the "backstock"-- things that I need once in a while but not every day, like bias tape makers and the scrap bindings I've made, as well as a few things I couldn't bear to part with. I have this shelving unit because the closet in here is very small and fairly useless. I added more shelves to it so that I could store project boxes (which are too big for the shelving unit) on one shelf and the scrap boxes on a shelf above them. The top shelf is all the tops I have to quilt up, and the batting is stored down on the floor. I keep intending to add another shelf, but I haven't gotten to it yet. This area is obviously still a work in progress. Right now I'm using the card table, which is not ideal, but we are making some changes in the kitchen and I will eventually have an old kitchen cabinet here. This can't happen soon enough for me. I have an ironing blanket all ready to fit over it, too, so that I'll be able to press longer pieces more easily. The design wall is really working out for me, though! So that's it! It may not look like much, but I am so, so happy with it. I feel lucky to have any space at all, but I'm really pleased with how my cleaning out and organizing turned out. It took me more than six months to get it near the way I want it, but it was really time well spent, even though it was very tiring and some of it was emotionally draining. I can tell you that I honestly had some serious jitters about the whole thing. What if I got rid of things I actually wanted or needed later? Would I be able to sew without worrying about everything? Almost none of my fears came to pass, and I don't miss the vast majority of the things I got rid of. And I'm happy every time I walk into the room, even if it is usually messy. --It can take a long time to clean out and sort many years worth of stuff. Don't get discouraged! Do a little at a time and it will start to come together. --Go slowly and take frequent breaks. Everything looks impossible when you're tired. Small treats also help. --A positive attitude is everything, and a sense of humor doesn't hurt, either. --Don't know where to start? Start anywhere, with the thing that is closest to where you are sitting. Just getting started will raise your spirits. --Read and take the advice of others, but remember that you have to arrange things the way they work for you. If somebody else's system seems great, it is-- for them. Your way will be great for you. --As always, whatever you decide to do with your own fabric and sewing materials is up to you! It's yours, so you get to decide! Thanks so much to everyone for coming along on this journey with me. I hope you got some good ideas, at least, and some encouragement to make your sewing area work well for you. I can tell you that all the hard work is worth it! And for future reference, I am collecting these posts on a tab at the top of the blog, so if you want to find them later it will be easy. Okay, enough cleaning! Let's go sew! Hi everyone! Wow, it's hot here! It was over 90 degrees here for most of this week. I saw pictures of other parts of the country, though, and I can't believe it was snowing this late in May. Looks like it's going to be a weird summer everywhere. Maybe you could send some of that cooler air this way, though. This one is destined for the Hands to Help Challenge at Confessions of a Fabric Addict. I made it using some blocks I picked up as a part of a scrap bag at my favorite quilt shop in Wisconsin. I think they made up into a cheerful little quilt, don't you? For this one, I had planned to try out some free motion patterns, but in the end I just did the free motion cross-hatching again. That is, I just did a cross hatch pattern freehand, without a walking foot or anything. What should I call that? Organic crosshatching? Freeform? Whatever we call it, it's very easy, which is what I liked most. In any case, it worked great! I'm really pleased with it. It didn't take that long to do and it was pretty mindless, which is good because I also had a movie on at the same time. I was listening to the movie more than watching it, but at least I didn't miss any plot points. I needed to keep that quilt moving through the machine, though, because it was awfully hot sitting on my lap. And there are no wrinkles in the backing! I am seriously happy. This little beauty was finished off with Susie's Magic Binding, which looks a little wavy in the pictures but is actually just fine. Sadly, I did not finish the Scrap Happy Rails top. Looks like that one is going to have to wait for the next donation round. Why force it? I'd rather slow down and enjoy it. Not to worry, though, the charities will get some other quilts that I've been saving up, so they still win. I hope whoever gets them really enjoys them, because I certainly put a lot of fun into making them. And that's the news from here! It's supposed to rain and then be a lot cooler, so I may be forced to work outside this weekend. Also, our big project for the summer is the kitchen, so there will be a lot of work to do there starting really soon. I get to destroy some things, which I'm really kind of looking forward to! Sharing at crazymomquilts, Confessions of a Fabric Addict, Finished or Not Friday, and Oh Scrap! Hi everyone, and welcome back to the Spring Cleaning series! We're almost at the end, and I'm really glad you're here! Our topic for today is scraps, those precious little pieces left after the main project is complete. Maybe you save your own, maybe you get them from friends, maybe you buy them in thrift shops and quilt stores--wherever they come from, storing them can be a problem. So many pieces floating around, so many colors, so many possibilities. Let's see if we can't tame that scrap monster! First, some good news for some of you--you don't have to save scraps if you don't want to! Really! It's your fabric, you can do whatever you want to with it. Toss those little pieces in the trash if you'd like, or use them as fire starters or pet bed stuffing. It would be kind to save them and give them away to someone who can use them, but you don't even have to do that. If you do want to save scraps for someone, keep a box by your cutting area. When it's full, seal it up and send it off. No mess in your sewing room, happiness for the recipient. Winner, winner, chicken dinner! If you do save scraps, there are a lot of ways to organize and store your scraps, but--as always--whatever you decide to do with your own fabric and scraps is the right thing to do. Find a system that works for you. It may take a few tries, but eventually you *will* get a handle on the scraps. There has been a lot written about scraps, with many, many blog posts and even entire books dedicated to this subject. These all boil down to two basic choices: you can save pieces and bits sorted roughly by color (or theme, or mood, or collection) or cut your leftovers into specific sizes and store the pieces by size. This is the basic choice, and the one thing that you really should decide before you start. You could also cut some pieces into sizes and save some pieces intact, which is what I do. If you decide to cut up all your scraps, there are a number of different systems and philosophies. Decide if one of these works for you, or if you want to make your own system. A couple of really popular "cutting" systems are Bonnie Hunter's Scrap User's System and Quilter Pat Sloan's Scrap Busting. Joan Ford also has a couple of Scrap Therapy books that include patterns for how to use the scraps you cut up. If you do decide to use one of these systems, don't overwhelm yourself with the cutting. Go slowly and cut just a handful of scraps at a time. It could take a while to cut everything up. If you aren't cutting them up for now, the main problem with scraps is storing them. The first thing to do--before you start sorting!-- is to decide which sizes of pieces are "scraps." Some people think of fat quarters as scraps, others think a scrap is anything smaller than a 5-inch square. You decide! This is going to have an impact on the types of containers you want to consider for storing your scraps. If the fat quarters are really scraps, then you're probably going to want to use larger containers, like baskets or bins. Along with this, decide what the smallest piece you'll save will be. I know quilters who save every little tiny bit and ones who toss anything smaller than 4 inches square. What do you want to save? If you save the smallest bits, will you actually use them? If not, why save them? If you won't use them but can't bring yourself to throw them out, save them separately for a friend who will use them. Your friend gets infusions of new fabrics occasionally and you get to get rid of those bits guilt free. Winners all around! There are a lot of possibilities, and you don't have to choose just one. I'm a big proponent of using what you have. All of the pictures above are actually from my sewing room. I mostly use the plastic bins, which are Gladware Entree size that came in packages of three, and I plan to make some of my own bins to replace the cheap brown ones. Someday! One place to find a lot of really cheap, interesting, and useful containers is your local Goodwill, Salvation Army, or St Vincent de Paul thrift store. These are especially good places to go if you want to find jars or other glassware, including mason jars in many sizes. They also usually have a bunch of different kinds of baskets and bins, equally inexpensive. Now that all of these decisions have been made, it's finally time to sort some scraps! The key to success is not to try to do it all at once. Definitely get all the scraps in one place--pull out every box, bin, and plastic grocery bag and keep them all together in one spot while you're sorting, but only sort one handful at a time. Be good to yourself and take frequent breaks, and allow yourself plenty of time to get it finished. Keep a box nearby, too, for anything that you want to give away. Though some people can sell their scraps by the pound or by the bag, I'm not sure how much market there is for this. You could always try, if that's your thing. You can also donate most scraps at the same places you donate fabric. And friends usually gratefully take scraps of all kinds! Most people probably sort by color family, but you can use any sorting principle that works for you-- warm colors and cool colors, darks and lights, prints and solids, batiks and cottons, dots and stripes, dogs and cats. . .whatever works for you! You can also mix different types of containers, and even choose to cut some scraps into standard sizes and keep others in chunks or irregular bits. The most important thing is that you find a way that makes sense to you. Just like with anything else, if it doesn't work for you--it doesn't work! Just to illustrate how a system unique to you can work, let me tell you about my scrap "system." I save most of my scraps sorted by color in the plastic Gladware bins, which are stacked on a shelf in the closet. I don't usually cut scraps into smaller pieces until I have nothing but little bits of that fabric left. Then I will cut those pieces into 2-1/2, 2-inch, or 1-1/2 inch squares. These squares get stored in plastic zipper bags, which are kept in those ugly brown bins. I also have some scraps from particular collections that I've wanted to keep together stored in plastic zipper bags in those bins. The basket holds scraps of flannel and specialty fabrics. The strings--which to me are strips that are less than 1-1/2 inches wide--are in the large jar, mainly because they look pretty in there. Hey, it works for me! The problem with scraps is that they just keep building up! The way to keep ahead of it is to keep a box or basket near your cutting area. Toss the scraps in there as you cut and sort them when the basket or box is full. I know myself that this is easier said than done! Eventually they do get sorted out, but that's usually after I've stuffed them down in the basket quite a bit. Of course, the best thing to do with scraps is make some scrap quilts, but that's a topic for someone else! I hope you got some good ideas here and can make a dent in those scraps, even if it's just to box them up and send them away. This brings us to the end of our spring cleaning topics! Next week is the big finale, with a little discussion of furniture, some pictures of my sewing room, and I have it on good authority that there is also a giveaway involved. Meet back here next Wednesday for the exciting conclusion! Hi all! Are you enjoying the springtime where you are? I spent this morning outside doing yard work because it's a beautiful spring day. Then I saw a snake and immediately came running into the house. I'm not a little girl any more, but apparently I can still scream like one. We didn't have garden snakes in Wisconsin, but apparently they're very common here. I wonder if I'll get used to them? This is just a smallish quilt that I'm finishing for the Hands to Help Challenge at Confessions of a Fabric Addict. I made it from some blocks that I picked up as part of a scrap bag sale plus a little bit of yardage I pulled from the stash. I think it's going to be quite cute. These are blocks for the Scrap Happy Rails quilt I'm making. The pattern is in Amanda Jean Nyberg's book No Scrap Left Behind. It's really easy, and I have just 6 blocks left to make for the size quilt I'm making, which is somewhat smaller than the one in the book. I'm absolutely stunned that I haven't used up all of these scrap pieces yet! It takes a *lot* of strings, but they seem to be breeding in that box. I know the instructions for sashing haven't come out yet, but it's easy enough to figure out, plus if I do this now there is less chance that August will get here and I'll have a pile of blocks that will continue to sit in a project box. I thought and thought about the sashing, but in the end I'm just using the white. It will really make those blocks stand out, don't you think? I hope everyone is having a wonderful week and making lots of progress, and that you haven't run across any snakes in your adventures. Hey, you don't think they can get into the house, do you? Yikes! Hi everyone, and welcome back to the Spring Cleaning series! Today we are tackling fabric and batting, so roll up your sleeves--it's about to get messy! Fabric, oh, all that glorious fabric! I just love it, don't you? It's so fun to shop for, cut, and stitch into something even more beautiful. Sometimes I just sit and look at the fabrics I own. True fact! That's why the rocking chair is in there. But I have also experienced the many despairing moments when I look at some fabrics and think "why do I have this?" And I spent years not really knowing what I had because I didn't have a good way to organize and store what I owned. **As always, what you decide to do with your fabric is entirely up to you! ** Here's something I know to be true: there is no "right" size for a fabric stash. There's no such thing as too big or too small unless you think it is. I've known quilters with tiny stashes and quilters with huge ones. If it's right for you, it's right! I see fabric as more of a storage and organization problem than a "size" problem, but I highly recommend this post by Rachel at Stitched in Color. It's worth it to consider whether all your fabric "fits" you or not. If you want to pull some of it out of your stash and pass it on, there is plenty of market for fabric! I did Rachel's exercises and ended up getting rid of a lot of fabrics in darker colors and those with the wrong "mood," if you know what I mean. More about where and how to get rid of unwanted fabric later, but for now, let's get organizing! The first thing to do is NOT to pull out all your fabric! Of course, if you have it stored in different places, it will probably help to get it all in one place, but don't start in on it just yet. Fabric can be so overwhelming that trying to do it all at once will just be frustrating and lead to failure. The first thing to do is pull out all the non-quilting fabric. Garment fabric and other types of fabric needs to be stored separately from quilting cotton. You'll need a storage solution for these, too, of course, but we're mainly talking about quilting fabrics here. I have had good success with storing garment yardage in see-through plastic totes with lids. Your fabric has to be in the totes for a very long time for the plastic to deteriorate it, so if it's going to be there that long you should consider just getting rid of it. I no longer make many clothes, choosing instead to alter ready to wear so that if actually fits, so most of my garment fabric got donated and some got made into bags and other useful items. * Folded or rolled and stored in a closet on hanging shelves made for clothes. These come in many sizes and can really expand your storage space. Once you've got a good idea how to store the fabric, it's time to dive in. Just grab about 20-25 pieces of yardage and start folding, rolling, or hanging. Put aside precuts and scraps or small pieces for now and concentrate on the yardage. Don't try to organize too much, but concentrate on getting the yardage pieces folded. Put them right into your new storage space as you go. Take a few breaths, too, and appreciate your fabric. Don't you have great taste? The key to getting this accomplished is not to try to do it all at once. Take frequent breaks and set a few reasonable goals, like getting a set number of pieces folded or rolled per day. This is hard work! Don't let yourself get too worn out, and remember that rewards are good, too. You know--chocolate, wine, a new fat quarter. . . When I get tired I tend to make bad fabric decisions, so don't let yourself get too tired or you may end up tossing out some pieces you'll need later. It may take a while, but eventually all of your yardage will be folded or hung in your new system. Now you can organize it all, in any way you choose. Many people--if not most--organize by color family, but you can also organize by project, by fabric collection, by manufacturer, by fabric type (regular cottons, batiks, hand dyes, etc), or even by something as unique as fabric mood. Choose something that's going to work well for you. I arranged my fabric loosely by color family, and separated out the batiks and the solids. I like to keep my stash small and where I can see everything, so it's all out on open shelves in the sewing room. Earlier I said to put the precuts aside, but those will also have to be organized. You can do this either before or after you tackle the yardage--whichever way makes you feel like you're making progress. I think the key to using precuts is to keep them together so that you can see what you have. I've actually stopped buying precuts, but I still do have some to work with, and I have been known to cut 5 and 10 inch squares. For organizing purposes, keep the precuts together, or at least keep all the precuts of each size together--all the 5-inch squares in one area, all the 10-inch squares together, and all the jelly rolls together. They can be stacked on shelves or kept in bins, boxes, or baskets, but really, keeping them together is key to knowing what you have and encouraging you to use it. I've got all of mine together on a shelf and am trying to use them all up. While yardage fits well in many different kinds of storage, fat quarters and other cuts smaller than about a half yard can be more difficult. Some people designate pieces this size as scraps, but I think of fabric as yardage until it's smaller than about 10 inches square. A lot depends on how many smaller pieces you have and what you want to do with them. They can be folded and sorted and stored with the yardage if they will fit into your system. You can also keep them together in boxes, bags, baskets, or plastic totes. Shoe-box sized plastic bins should hold a lot of fat quarters and smaller pieces. You could designate an area on your shelves just for the fat quarters and keep them together there. If you have a lot of smaller pieces you could sort them by color and arrange them in separate containers and store them with the yardage. I used something a bit unconventional to store my fat quarters--a plastic shoe bag that fits on the back of a door. The silly thing works great! It's the perfect size for them. I had been keeping this extensive collection in baskets and totes, but I didn't like that I couldn't see them all. This is much better for me and a lot more of them are getting used. And I didn't have to make shelf space for them! In addition to yardage, we quilters also have a lot of works in progress that need storing while we work on them (or intend to, anyway). It's a good idea to keep all the fabric for a project together so that it doesn't get used up in something else, or (in my case) so you can find it when you need it. There are a lot of good ways to do this. I know some people who keep their projects all together on shelves, sorted by project. There are wire shelf dividers and wire shelves or bins that hang under shelves that make this easier to organize. Other ways to keep projects together include extra large zipper bags, baskets, bins of all sizes, or even unused pizza boxes, which are very cheap. All of these can be found in many sizes at big box stores or online. I bought Artbin plastic boxes at a warehouse store, where they came in packages of 6. (I have 12 of these, because I cannot resist a bargain.) These fit nicely on shelves and hold a lot, but are too large for my shelving unit. Clearly I was blinded by the great price. However you store and organize your fabric, remember that the system has to work for you. I always get jealous when I see perfectly organized sewing rooms, but then when I think about it I realize that how that person has things arranged--or the amount of fabric they have--would drive me crazy. If it doesn't work for you, it doesn't work. It may take a few tries, but working out a storage system that you can use and keep up with will reward you with a much better sewing environment--not to mention a real sense of accomplishment. Then you can sew without any guilt whatsoever! What's a quilt without batting? Very thin, that's for sure. Batting is essential but it can be hard to store because it's so bulky. Fortunately, it squishes. Unlike fabric, there are not a lot of different ways to store batting. It can be folded or rolled or kept in bins or boxes, but its bulk limits where you can keep it. You can fold it on shelves, or roll it to store on shelves or in bins, or squish it into totes or boxes. The best way I have found to store batting it to keep it in the original packages and stuff as many as I can into a bin, standing them on end if possible. When the bin is full, it's time to stop buying batting and start using it. I only buy batting on sale, so that's not too hard. What about the smaller pieces? You can throw them out, of course, or use them for dusting or cleaning (which they are great for, especially if you cut them to fit a Swiffer to clean wood floors), but you can also piece together leftovers of all sizes to make larger pieces to use in quilts, which is both thrifty and satisfying. A video and instructions are HERE. Bonnie Hunter does it slightly differently HERE. I do this all the time and call it "Frankenstein batting." I've never had a problem using it any quilt, and I can't even tell which ones I've used it in after they're quilted. To store the smaller pieces and cut-offs, you can stuff them into anything that will hold them, from boxes and bins to pillowcases. I have had good luck storing batting pieces in blanket storage bags. These are inexpensive and see-through and will hold a lot of pieces of batting. I have a few for different kinds of batting--cotton, wool, blend, etc. You could fold the batting and put it in there nicely, but I just stuff it in there until I'm ready to stitch some of it together. I know some people purchase entire 30 or 40 yard rolls of batting, but I have never done this, mainly because I don't have the storage area for it. I would either store these rolls upright in a dedicated closet or find a way to hang them horizontally on a rod of some sort. Anyone who uses this have other ideas? As noted above, you may pull out some pieces of yardage that you don't want any more. (This is not a bad thing!) The good news is that there is a very large secondary market for fabric yardage of all types, and even for precuts from manufacturers (not cut by individuals). You will have some success selling yardage through your blog, Etsy, Ebay, etc. If you have a lot to get rid of, you may want to set up an Etsy or Ebay site just for selling it off. As I said last week, there are also Facebook groups for this purpose, but I don't really know anything about them. If you know of other places to donate fabric, please let us all know in the comments! Choose charities that fit your needs. I really recommend getting in touch with schools, churches, and charities like Project Linus in your own community. Don't overlook retirement homes and places like halfway houses and prisons. Your donation could help keep a program going, and they are always very grateful. As a last resort, places like Goodwill, the Salvation Army, and St. Vincent de Paul thrift stores will take fabric donations if they are folded and organized. (In other words, not a messy box of scraps.) But really, please consider this a last resort. That brings us to the end of this topic! I hope it gave you some good ideas and that you have done something to make your sewing space better. Next week we'll talk about some strategies for scraps and other small pieces, which will be entertaining. Meet back here next Wednesday for that exciting chapter! Hi everyone! How was your week? This was the last week of class--yay! And not all my classes have finals, so we're just about at the end. Then I plan to sleep for at least a week. It's about 38 by 38, which makes it a small baby size, but I think it would look great on a spring table, don't you? It was a really cloudy day and I couldn't get the best picture of the colors, but the sashing and binding are both a lovely aqua color. I made this little top a couple of years ago from the blocks I made for a failed project. The quilt shop that I used to live near (and I still love!) ran a year-long project making the Loyal Union Sampler by Jennifer Chiaverini. These blocks were as far as I got. They were lovely, but the project as a whole just never really excited me. So when I needed a finish this week, this little top was just hanging there, waiting. This is as good an argument as any I've ever heard for keeping some UFOs handy, too. I quilted it in a free hand cross hatch, by which I mean that I didn't use a walking foot, just the free motion foot for the machine. The rows are pretty straight but got wobbly in a couple of places. Oh, well! The overall effect is pretty nice, and doing the quilting itself was pretty soothing, almost like meditation. So that was my finish for the week! It felt pretty good to sew, and it felt great to finish this. And I'm feeling a lot more relaxed now, too. Don't know what I'm going to do with this little quilt, but I'm putting it in the win column! I don't know what this is, but it's pretty! It has also been chopped up, but it looks like it's coming back pretty well already. And who can resist those lovely flowers? You should see the size of the honey bees hanging out around those flowers! Hope everyone has a great weekend! It's going to rain like crazy all weekend, so I expect to make a lot of progress on a lot of things. I'll probably just end up taking a nap or baking something, though. I'll let you know! Hi everyone, and welcome back to the Spring Cleaning series! Today's topic is notions, rulers, and thread--all the little essentials which end up everywhere but you can never find when you need them. Whether you have too little or too much, come on along and let's see if we can get organized together. For this step, you're going to need a bag for trash and some organizing aids for the things you keep, plus a box or two for things you want to give away. Read on to see what those containers and such could be. Is it possible to make notions look glamorous? Lots to talk about today! For this topic, I'm just going to go through each component one at a time, and then talk about what to do with the things you don't want at the end of the post. Also, I want to say right up front that I found this to be the most difficult aspect of the whole clean out project. So many little things, in so many different places! It took me several weeks to get all the way through, so take your time and don't get too frustrated. I also recommend keeping some chocolate nearby to lift your spirits. Somehow the mess always seems to wait for you! Ready? Let's start here. . . This is a good place to start on the notions because it's colorful and fun to look at, and it's easy to make progress. Not surprisingly, this starts with grabbing all your thread and putting it out on a table or counter. Dig through everything and try to find every spool you own. Grab the bobbins, too. Get it all out there at once. The first step is to separate the different types of thread. Separate the thread by its use--quilting thread, garment thread, silk thread, serger thread, embroidery thread, etc. Then take one type of thread and sort it. Will you use this spool again? Is it hopelessly tangled? Is it one you abandoned because it kept breaking in your machine? Is it day-glo orange that hurts your eyes? If you won't use it or you've tried it and it doesn't work well for you, toss it. Just throw it in the bin and forget about it. Yes, thread can be expensive, but bad thread is not worth any price. Don't forget to check your bobbins, too. I would toss any thread that is discolored or faded, any spools that are broken, and even some where there is very little thread left. Plastic spools can be recycled. I would keep wooden spools as a decoration, but I would hesitate to use the thread on them. If you have usable thread that you just don't like--maybe you stopped using that brand-- go ahead and put them in a box for donation later on. What about old thread? I've never really tried to use old thread, but I'm hesitant. I generally aim for high turnover in thread, buying only a few spools at a time. HERE is a post defending old thread, and HERE is another take on it. I guess I would test it to see if it breaks. If not, keep it. Ultimately, you have to do what makes you comfortable. Once you've got your thread sorted out, the key to storing thread (and any notion) is to keep like types together, and to keep the thread you use most often easily accessible. Thread racks work well, and many bobbins can also be stored on thread racks if they will fit on the spool. But you don't have to buy something new! Boxes and trays also work for thread storage. Deep boxes will hold large thread cones, and boxes of all types can be stored on shelves. Bobbins can be stored in smaller boxes, baskets, or even bags or jars, or in boxes or storage containers made just for them. Just remember that you want to be able to find things when you need them , and to keep like things together. If you have several places where you use thread, it wouldn't hurt to find a storage area near where it will be used. For example, keep the longarm thread all together near the longarm. The key here is the same as for all other notions--like goes with like. That is, keep all of one type of thing together. It's probably a good idea to go through these and make sure you want to keep what you have. Separate the CDs from the DVDs, and keep each of these in a box or basket or on a shelf near where you use them. The same goes for computer memory cards and jump drives, if you keep a computer in your sewing area-- keep all of these together in one basket or box near the computer. Dies for cutting systems (like Accuquilt) should also be kept together. I don't have one of these, but a decorative box or crate seems like a good bet, or a drawer if you have one in your sewing area. You could also try one of the many types of storage made for plates or other cooking implements. A lot depends on the size of your dies and how many you have. If you're buying something new, take your largest die with you to make sure it will fit. Be sure to keep whatever storage you choose in your cutting area so that you can get to your dies when you want them. At the risk of repeating myself, keep like things together in the area where you will use them. Baskets and decorative boxes or plastic bins can hold a lot of things in your longarm area. If the templates are the right size, you can store them together in plastic page pockets in binders (see last post) just like paper templates. Just remember that you want to find a storage area near the longarm so you can find everything when you need it. Oh, rulers! So many kinds, so much money for them! This could be a hard one, folks, because there are so many choices to be made. It seems that every new pattern demands a new kind of ruler, and those pieces of plastic can be really pricey. (I think $25 is a lot to pay for a specialty ruler. That's two yards of designer fabric!) This means we end up with a lot of plastic! Some end up in a drawer or box because they're only good for making one pattern or a very limited set of patterns, but we don't want to get rid of them because they cost so much or because we might need them someday. Still, they clutter things up and drag us down. Sort rulers the same way you did the books: get everything out and put it all on a table to sort. Don't forget the small ones by the machine! Start with the ones you use every day (or at least every month or so) and put those aside as "must keep." For me, this was a 12 x 6 and 2 6-1/2 inch square rulers. Next, consider each one and decide whether it's useful or not. Is it duplicated by another ruler? For example, do you need an 8-1/2 inch square and a 9-1/2 inch square? Maybe so--which is fine! Save the ones you really need. If you can't decide, make a "maybe" pile and think about it. It should go without saying that anything that's broken or too worn to use should be tossed out. If you just can't get rid of any rulers (which is fine!) at least you can open up some useful space in the sewing area by storing the specialty rulers in a box or tote bag away from the main space. Put them in a closet in another room, under a bed, or in your home's storage area. When you want to make a pattern with them, you'll still have them but you won't have to move them around to get to the rulers you actually use every day. Rulers are most useful if you keep them near where you actually use them to cut things. If you have the space and a bunch of rulers, a pegboard could work really well. (A very clear pegboard tutorial is HERE.) Command hooks are also really good for hanging rulers on the wall above the cutting area. You could also hang them on the back of a door or the side of a table. Drawers are nice, too, as long as they are accessible in the cutting area. I said that the rulers were hard, but this one is really hard because there are *tons* of small things floating around everywhere. It's best to start sorting through these notions when you're in a good mood and are feeling just a bit ruthless. You know how to start--get it all out and on the table. Find every seam ripper, seam guide, pin, thimble, doohickey, and gadget that you have. Throw in all the different kinds of marking tools you have, all the needles, all the different glues and adhesives, and all the cleaning brushes you can find. Just get it all out there. Now comes the sorting. The central principles are very simple--does it work? and do I use it? If the answer to either of these questions is no, it should go. You can donate it, but if it won't be used, there's no need for it to be in your sewing room. Does the seam ripper rip seams, or is it dull? Are the pins still straight and sharp? That gadget designed by a really famous quilter that some of your friends absolutely swear by but you could never figure out? Out it goes. If it doesn't work for you, it doesn't work. Toss the item and the guilt and use the things that do work for you. Once you have everything sorted, there are a lot of ways to store these little things, none of which have to cost a lot. The important thing to remember when storing these is that "like goes with like"-- similar items should be kept together. For example, all of the sizes of bias tape makers should be stored in the same box, and all of the needles should be in the same place. Small baskets, boxes, or bins work, as do jars of all types and even decorative coffee cups. Save spaghetti sauce or fruit jars for storing some items (run them through the dishwasher or wash them in hot water first), or the plastic containers from some drink mixes, which are perfect for storing marking pens or colored pencils. Any of the small, cheap plastic food storage containers with lids can also work well. They're really inexpensive and come in a wide variety of sizes and shapes. Many useful containers don't have to be expensive. Try to keep the items that you use most near the place where you use them and put others into a "deeper storage," which can just be a box at the back of a shelf. You'd want to keep seam rippers close, for example, but use bias tape makers less frequently, so they could be stored a bit further away. I know I haven't thought of everything, but the general ideas apply to any notion you find: if it isn't useful to you, it needs to go, and store like items together near the areas where they'll be used. Anything that is broken or badly used should be thrown out. You may be able to sell some things if they are new in their original packages and have never been used. This includes rulers, and specialty rulers should also have directions with them. There is some secondary market for notions, especially specialty ones, and selling through your blog, Etsy, or Ebay is a good bet. I know there are also Facebook groups just for selling sewing items, but I don't belong to any of them so I can't vouch for them. 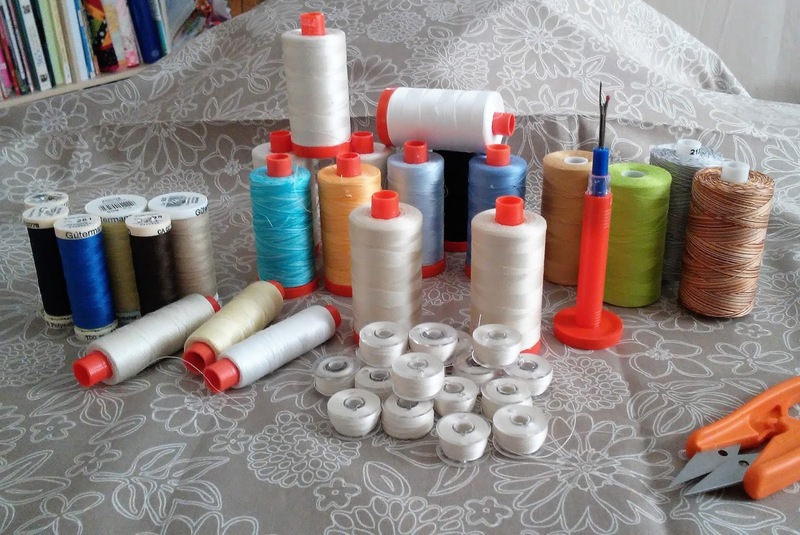 If you have usable notions that are not new but gently used, or full spools of thread that you don't want, they can be donated and used by others at the the same places you would donate fabric. Otherwise, they can be given away to friends who will use them, on guild tables, or to some thrift shops or organizations. Wow, this is long! There was a lot to sort through! I hope you made some progress and are feeling better about things! Thanks for coming this far! Next week we tackle the fabric, which seems to be the post everyone has been waiting for. I'll have some sorting and organizational suggestions for fabric and batting, along with places to donate some of the pieces you want to give away. See you back here then!